This article is about the country. For other uses, see Scotland (disambiguation). "In my defence God me defend"
Predominantly " Flower of Scotland"
Scotland (Scots: Scotland; Scottish Gaelic: Alba [ˈal̪ˠapə] ( listen)) is a country that is part of the United Kingdom. 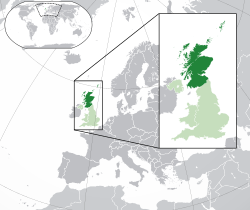 Sharing a border with England to the southeast, Scotland is otherwise surrounded by the Atlantic Ocean to the north and west, by the North Sea to the northeast and by the Irish Sea to the south. In addition to the mainland, situated on the northern third of the island of Great Britain, Scotland has over 790 islands, including the Northern Isles and the Hebrides. 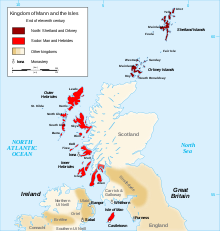 The Kingdom of Scotland emerged as an independent sovereign state in the Early Middle Ages and continued to exist until 1707. 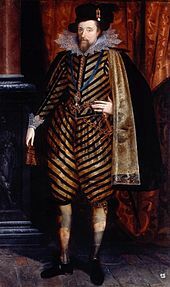 By inheritance in 1603, James VI, King of Scots, became King of England and King of Ireland, thus forming a personal union of the three kingdoms. Scotland subsequently entered into a political union with the Kingdom of England on 1 May 1707 to create the new Kingdom of Great Britain. The union also created a new Parliament of Great Britain, which succeeded both the Parliament of Scotland and the Parliament of England. In 1801, the Kingdom of Great Britain and Kingdom of Ireland enacted a political union to create a United Kingdom. The majority of Ireland subsequently seceded from the UK in 1922. Within Scotland, the monarchy of the United Kingdom has continued to use a variety of styles, titles and other royal symbols of statehood specific to the pre-union Kingdom of Scotland. The legal system within Scotland has also remained separate from those of England and Wales and Northern Ireland; Scotland constitutes a distinct jurisdiction in both public and private law. The continued existence of legal, educational, religious and other institutions distinct from those in the remainder of the UK have all contributed to the continuation of Scottish culture and national identity since the 1707 union with England. The Scottish Parliament, which is a unicameral legislature comprising 129 members, was established in 1999 and has authority over those areas of domestic policy which have been devolved by the United Kingdom Parliament. The head of the Scottish Government, the executive of the devolved legislature, is the First Minister of Scotland. Scotland is represented in the UK House of Commons by 59 MPs and in the European Parliament by 6 MEPs. Scotland is also a member of the British–Irish Council, and sends five members of the Scottish Parliament to the British–Irish Parliamentary Assembly. Scotland is divided into 32 subdivisions, known as local authorities, or councils. Glasgow City is the largest subdivision in Scotland in terms of population, with Highland being the largest in terms of area. The Wallace Monument commemorates William Wallace, the 13th-century Scottish hero. James VI succeeded to the English and Irish thrones in 1603. The Treaty of Perpetual Peace was signed in 1502 by James IV of Scotland and Henry VII of England. James married Henry's daughter, Margaret Tudor. James invaded England in support of France under the terms of the Auld Alliance and became the last British monarch to die in battle, at Flodden in 1513. In 1560, the Treaty of Edinburgh brought an end to the Anglo-French conflict and recognized the Protestant Elizabeth I as Queen of England. :112 The Parliament of Scotland met and immediately adopted the Scots Confession, which signaled the Scottish Reformation's sharp break from papal authority and Catholic teaching. :44 The Catholic Mary, Queen of Scots was forced to abdicate in 1567. In 1698, the Company of Scotland attempted a project to secure a trading colony on the Isthmus of Panama. Although it received a huge investment, the Darien scheme failed, partially due to English hostility. Along with the threat of an English invasion, the resulting bankruptcies played a leading role in convincing the Scots elite to back a union with England. :143 On 22 July 1706, the Treaty of Union was agreed between representatives of the Scots Parliament and the Parliament of England. The following year twin Acts of Union were passed by both parliaments to create the united Kingdom of Great Britain with effect from 1 May 1707 with popular opposition and anti-union riots in Edinburgh, Glasgow, and elsewhere. The Scottish Reform Act 1832 increased the number of Scottish MPs and widened the franchise to include more of the middle classes. From the mid-century, there were increasing calls for Home Rule for Scotland and the post of Secretary of State for Scotland was revived. In the later 19th century the growing importance of the working classes was marked by Keir Hardie's success in the 1888 Mid Lanarkshire by-election, leading to the foundation of the Scottish Labour Party, which was absorbed into the Independent Labour Party in 1895, with Hardie as its first leader. Glasgow became one of the largest cities in the world and known as "the Second City of the Empire" after London. After 1860 the Clydeside shipyards specialised in steamships made of iron (after 1870, made of steel), which rapidly replaced the wooden sailing vessels of both the merchant fleets and the battle fleets of the world. It became the world's pre-eminent shipbuilding centre. The industrial developments, while they brought work and wealth, were so rapid that housing, town-planning, and provision for public health did not keep pace with them, and living conditions in some of the towns and cities worsened, with overcrowding, high infant mortality, and growing rates of tuberculosis. The population of Scotland grew steadily in the 19th century, from 1,608,000 in the census of 1801 to 2,889,000 in 1851 and 4,472,000 in 1901. Even with the development of industry, there were not enough good jobs. As a result, during the period 1841–1931, about 2 million Scots migrated to North America and Australia, and another 750,000 Scots relocated to England. While the Scottish Enlightenment is traditionally considered to have concluded toward the end of the 18th century, disproportionately large Scottish contributions to British science and letters continued for another 50 years or more, thanks to such figures as the physicists James Clerk Maxwell and Lord Kelvin, and the engineers and inventors James Watt and William Murdoch, whose work was critical to the technological developments of the Industrial Revolution throughout Britain. This period saw a process of rehabilitation for Highland culture. In the 1820s, as part of the Romantic revival, tartan and the kilt were adopted by members of the social elite, not just in Scotland, but across Europe, prompted by the popularity of Macpherson's Ossian cycle and then Walter Scott's Waverley novels. In literature, the most successful figure of the mid-19th century was Walter Scott. His first prose work, Waverley in 1814, is often called the first historical novel. It launched a highly successful career that probably more than any other helped define and popularise Scottish cultural identity. 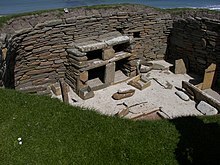 Scotland also played a major part in the development of art and architecture. The Glasgow School, which developed in the late 19th century, and flourished in the early 20th century, produced a distinctive blend of influences including the Celtic Revival the Arts and Crafts movement, and Japonism, which found favour throughout the modern art world of continental Europe and helped define the Art Nouveau style. Proponents included architect and artist Charles Rennie Mackintosh. However, the Highlands remained poor, the only part of mainland Britain to continue to experience recurrent famine, with a limited range of products exported out of the region, negligible industrial production, but a continued population growth that tested the subsistence agriculture. These problems, and the desire to improve agriculture and profits were the driving forces of the ongoing Highland Clearances, in which many of the population of the Highlands suffered eviction as lands were enclosed, principally so that they could be used for sheep farming. The first phase of the clearances followed patterns of agricultural change throughout Britain. The second phase was driven by overpopulation, the Highland Potato Famine and the collapse of industries that had relied on the wartime economy of the Napoleonic Wars. After prolonged years of struggle in the Kirk, in 1834 the Evangelicals gained control of the General Assembly and passed the Veto Act, which allowed congregations to reject unwanted "intrusive" presentations to livings by patrons. In the Disruption of 1843, roughly a third of the clergy, mainly from the North and Highlands, formed the separate Free Church of Scotland. Catholic emancipation in 1829 and the influx of large numbers of Irish immigrants, particularly after the famine years of the late 1840s, mainly to the growing lowland centres like Glasgow, led to a transformation in the fortunes of Catholicism. In 1878, despite opposition, a Roman Catholic ecclesiastical hierarchy was restored to the country, and Catholicism became a significant denomination within Scotland. Industrialisation, urbanisation and the Disruption of 1843 all undermined the tradition of parish schools. From 1830 the state began to fund buildings with grants; then from 1846 it was funding schools by direct sponsorship; and in 1872 Scotland moved to a system like that in England of state-sponsored largely free schools, run by local school boards. The historic University of Glasgow became a leader in British higher education by providing the educational needs of youth from the urban and commercial classes, as opposed to the upper class. 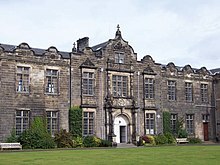 The University of St Andrews pioneered the admission of women to Scottish universities. From 1892 Scottish universities could admit and graduate women and the numbers of women at Scottish universities steadily increased until the early 20th century. Scotland played a major role in the British effort in the First World War. It especially provided manpower, ships, machinery, fish and money. With a population of 4.8 million in 1911, Scotland sent over half a million men to the war, of whom about 100,000 died and 150,000 were seriously wounded. :203 The socialist "Red Clydeside" movement, led by militant trade unionists, emerged during the war in response to war profiteering by landlords and capitalists. :204–205 Formerly a Liberal stronghold, the industrial districts switched to Labour by 1922, with a base among the Irish Catholic working-class districts. Women were especially active in building neighbourhood solidarity on housing issues. However, the "Reds" operated within the Labour Party and had little influence in Parliament and the mood changed to passive despair by the late 1920s. The shipbuilding industry expanded by a third and expected renewed prosperity, but instead, a serious depression hit the economy by 1922 and it did not fully recover until 1939. The interwar years were marked by economic stagnation in rural and urban areas, and high unemployment. Indeed, the war brought with it deep social, cultural, economic, and political dislocations. Thoughtful Scots pondered their declension, as the main social indicators such as poor health, bad housing, and long-term mass unemployment, pointed to terminal social and economic stagnation at best, or even a downward spiral. Service abroad on behalf of the Empire lost its allure to ambitious young people, who left Scotland permanently. The heavy dependence on obsolescent heavy industry and mining was a central problem, and no one offered workable solutions. 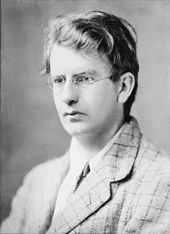 The despair reflected what Finlay (1994) describes as a widespread sense of hopelessness that prepared local business and political leaders to accept a new orthodoxy of centralised government economic planning when it arrived during the Second World War. As part of the Blitz by Nazi Germany on the UK, factories, shipyards, and coal mines in Scotland came under attack during the Second World War. Cities such as Glasgow and Edinburgh were targeted by German bombers, as were smaller towns mostly located in the central belt of the country. Perhaps the most significant air-raid in Scotland was the Clydebank Blitz of March 1941, which intended to destroy naval shipbuilding in the area. 528 people were killed and 4,000 homes totally destroyed. As in World War I, Scapa Flow in Orkney served as an important Royal Navy base. Attacks on Scapa Flow and Rosyth gave RAF fighters their first successes downing bombers in the Firth of Forth and East Lothian. The shipyards and heavy engineering factories in Glasgow and Clydeside played a key part in the war effort, and suffered attacks from the Luftwaffe, enduring great destruction and loss of life. As transatlantic voyages involved negotiating north-west Britain, Scotland played a key part in the battle of the North Atlantic. Shetland's relative proximity to occupied Norway resulted in the Shetland bus by which fishing boats helped Norwegians flee the Nazis, and expeditions across the North Sea to assist resistance. Scottish industry came out of the depression slump by a dramatic expansion of its industrial activity, absorbing unemployed men and many women as well. The shipyards were the centre of more activity, but many smaller industries produced the machinery needed by the British bombers, tanks and warships. Agriculture prospered, as did all sectors except for coal mining, which was operating mines near exhaustion. Real wages, adjusted for inflation, rose 25% and unemployment temporarily vanished. 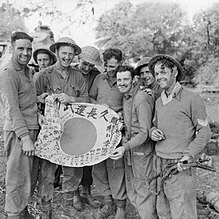 Increased income, and the more equal distribution of food, obtained through a tight rationing system, dramatically improved the health and nutrition. After 1945, Scotland's economic situation worsened due to overseas competition, inefficient industry, and industrial disputes. Only in recent decades has the country enjoyed something of a cultural and economic renaissance. Economic factors contributing to this recovery included a resurgent financial services industry, electronics manufacturing, (see Silicon Glen), and the North Sea oil and gas industry. The introduction in 1989 by Margaret Thatcher's government of the Community Charge (widely known as the Poll Tax) one year before the rest of Great Britain, contributed to a growing movement for Scottish control over domestic affairs. Following a referendum on devolution proposals in 1997, the Scotland Act 1998 was passed by the UK Parliament, which established a devolved Scottish Parliament and Scottish Government with responsibility for most laws specific to Scotland. The Scottish Parliament was reconvened in Edinburgh on 4 July 1999. The first First Minister of Scotland was Donald Dewar, who served until his sudden death in 2000. The Scottish Parliament Building at Holyrood itself did not open until October 2004, after lengthy construction delays and running over budget. The Scottish Parliament has a form of proportional representation (the additional member system), which normally results in no one party having an overall majority. The pro-independence Scottish National Party led by Alex Salmond achieved this in the 2011 election, winning 69 of the 129 seats available. The success of the SNP in achieving a majority in the Scottish Parliament paved the way for the September 2014 referendum on Scottish independence, in which 55% voted against independence. More powers, particularly in relation to taxation, were devolved to the Scottish Parliament after the referendum, following cross-party talks in the Smith Commission. The mainland of Scotland comprises the northern third of the land mass of the island of Great Britain, which lies off the north-west coast of Continental Europe. The total area is 78,772 km2 (30,414 sq mi), comparable to the size of the Czech Republic. Scotland's only land border is with England, and runs for 96 kilometres (60 mi) between the basin of the River Tweed on the east coast and the Solway Firth in the west. The Atlantic Ocean borders the west coast and the North Sea is to the east. The island of Ireland lies only 21 kilometres (13 mi) from the south-western peninsula of Kintyre; Norway is 305 kilometres (190 mi) to the east and the Faroe Islands, 270 kilometres (168 mi) to the north. The territorial extent of Scotland is generally that established by the 1237 Treaty of York between Scotland and the Kingdom of England and the 1266 Treaty of Perth between Scotland and Norway. Important exceptions include the Isle of Man which, having been lost to England in the 14th century, is now a crown dependency outside of the United Kingdom; the island groups Orkney and Shetland, which were acquired from Norway in 1472; and Berwick-upon-Tweed, lost to England in 1482. The geographical centre of Scotland lies a few miles from the village of Newtonmore in Badenoch. 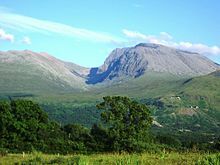 Rising to 1,344 metres (4,409 ft) above sea level, Scotland's highest point is the summit of Ben Nevis, in Lochaber, while Scotland's longest river, the River Tay, flows for a distance of 190 kilometres (118 mi). The whole of Scotland was covered by ice sheets during the Pleistocene ice ages and the landscape is much affected by glaciation. From a geological perspective, the country has three main sub-divisions. The Highlands and Islands lie to the north and west of the Highland Boundary Fault, which runs from Arran to Stonehaven. This part of Scotland largely comprises ancient rocks from the Cambrian and Precambrian, which were uplifted during the later Caledonian orogeny. It is interspersed with igneous intrusions of a more recent age, remnants of which formed mountain massifs such as the Cairngorms and Skye Cuillins. A significant exception to the above are the fossil-bearing beds of Old Red Sandstones found principally along the Moray Firth coast. The Highlands are generally mountainous and the highest elevations in the British Isles are found here. Scotland has over 790 islands divided into four main groups: Shetland, Orkney, and the Inner Hebrides and Outer Hebrides. There are numerous bodies of freshwater including Loch Lomond and Loch Ness. Some parts of the coastline consist of machair, a low-lying dune pasture land. The Central Lowlands is a rift valley mainly comprising Paleozoic formations. Many of these sediments have economic significance for it is here that the coal and iron bearing rocks that fuelled Scotland's industrial revolution are found. This area has also experienced intense volcanism, Arthur's Seat in Edinburgh being the remnant of a once much larger volcano. This area is relatively low-lying, although even here hills such as the Ochils and Campsie Fells are rarely far from view. The Southern Uplands are a range of hills almost 200 kilometres (124 mi) long, interspersed with broad valleys. They lie south of a second fault line (the Southern Uplands fault) that runs from Girvan to Dunbar. The geological foundations largely comprise Silurian deposits laid down some 400–500 million years ago. The high point of the Southern Uplands is Merrick with an elevation of 843 m (2,766 ft). The Southern Uplands is home to the UK's highest village, Wanlockhead (430 m or 1,411 ft above sea level). The climate of Scotland is temperate and oceanic, and tends to be very changeable. As it is warmed by the Gulf Stream from the Atlantic, it has much milder winters (but cooler, wetter summers) than areas on similar latitudes, such as Labrador, southern Scandinavia, the Moscow region in Russia, and the Kamchatka Peninsula on the opposite side of Eurasia. However, temperatures are generally lower than in the rest of the UK, with the coldest ever UK temperature of −27.2 °C (−17.0 °F) recorded at Braemar in the Grampian Mountains, on 11 February 1895. Winter maxima average 6 °C (43 °F) in the Lowlands, with summer maxima averaging 18 °C (64 °F). The highest temperature recorded was 32.9 °C (91.2 °F) at Greycrook, Scottish Borders on 9 August 2003. The west of Scotland is usually warmer than the east, owing to the influence of Atlantic ocean currents and the colder surface temperatures of the North Sea. Tiree, in the Inner Hebrides, is one of the sunniest places in the country: it had more than 300 hours of sunshine in May 1975. Rainfall varies widely across Scotland. The western highlands of Scotland are the wettest, with annual rainfall in a few places exceeding 3,000 mm (120 in). In comparison, much of lowland Scotland receives less than 800 mm (31 in) annually. Heavy snowfall is not common in the lowlands, but becomes more common with altitude. Braemar has an average of 59 snow days per year, while many coastal areas average fewer than 10 days of lying snow per year. 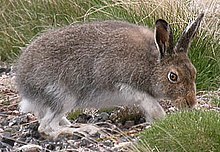 Scotland's wildlife is typical of the north-west of Europe, although several of the larger mammals such as the lynx, brown bear, wolf, elk and walrus were hunted to extinction in historic times. There are important populations of seals and internationally significant nesting grounds for a variety of seabirds such as gannets. The golden eagle is something of a national icon. On the high mountain tops, species including ptarmigan, mountain hare and stoat can be seen in their white colour phase during winter months. Remnants of the native Scots pine forest exist and within these areas the Scottish crossbill, the UK's only endemic bird species and vertebrate, can be found alongside capercaillie, Scottish wildcat, red squirrel and pine marten. Various animals have been re-introduced, including the white-tailed sea eagle in 1975, the red kite in the 1980s, and there have been experimental projects involving the beaver and wild boar. Today, much of the remaining native Caledonian Forest lies within the Cairngorms National Park and remnants of the forest remain at 84 locations across Scotland. On the west coast, remnants of ancient Celtic Rainforest still remain, particularly on the Taynish peninsula in Argyll, these forests are particularly rare due to high rates of deforestation throughout Scottish history. The flora of the country is varied incorporating both deciduous and coniferous woodland as well as moorland and tundra species. However, large scale commercial tree planting and the management of upland moorland habitat for the grazing of sheep and commercial field sport activities impacts upon the distribution of indigenous plants and animals. The five tallest trees in the UK are located in Scotland. Although the number of native vascular plants is low by world standards, Scotland's substantial bryophyte flora is of global importance. 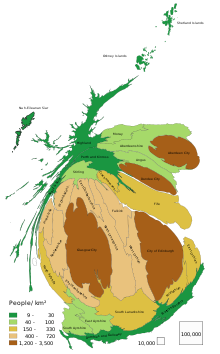 Scotland's population cartogram. The size of councils shows their population. The population of Scotland in the 2011 census was 5,295,400, the highest ever recorded. The most recent ONS estimate, for mid-2017, was 5,424,800. 62% of Scotland's population stated their national identity as 'Scottish only', 18% as 'Scottish and British', 8% as 'British only', and 4% chose 'other identity only'. Although Edinburgh is the capital of Scotland, the largest city is Glasgow, which has just over 584,000 inhabitants. The Greater Glasgow conurbation, with a population of almost 1.2 million, is home to nearly a quarter of Scotland's population. The Central Belt is where most of the main towns and cities are located, including Glasgow, Edinburgh, Dundee, and Perth. Scotland's only major city outside the Central Belt is Aberdeen. Because of housing problems in Glasgow and Edinburgh, five new towns were designated between 1947 and 1966. They are East Kilbride, Glenrothes, Cumbernauld, Livingston, and Irvine. Scotland has fewer than 90 inhabited islands, typically the larger and more accessible ones. The Southern Uplands are essentially rural in nature and dominated by agriculture and forestry. The total fertility rate (TFR) in Scotland is below the replacement rate of 2.1 (the TFR was 1.73 in 2011). The majority of births are to unmarried women (51.3% of births were outside of marriage in 2012). Life expectancy for those born in Scotland between 2012 and 2014 is 77.1 years for males and 81.1 years for females. This is the lowest of any of the four countries of the UK. Immigration since World War II has given Glasgow, Edinburgh, and Dundee substantial but small South Asian communities. In 2011, there were an estimated 49,000 ethnically Pakistani people living in Scotland, making them the largest non-White ethnic group. Since the Enlargement of the European Union more people from Central and Eastern Europe have moved to Scotland, and the 2011 census indicated that 61,000 Poles live there. Scotland has four officially recognised languages: English, Scots, Scottish Gaelic and British Sign Language. Scottish Standard English, a variety of English as spoken in Scotland, is at one end of a bipolar linguistic continuum, with broad Scots at the other. Scottish Standard English may have been influenced to varying degrees by Scots. The 2011 census indicated that 63% of the population had "no skills in Scots". Others speak Highland English. Gaelic is mostly spoken in the Western Isles, where a large proportion of people still speak it; however, nationally its use is confined to just 1% of the population. 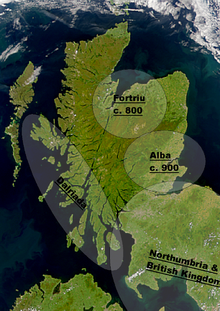 The number of Gaelic speakers in Scotland dropped from 250,000 in 1881 to 60,000 in 2008. In the late twentieth century, about 25 million people outside Scotland were of Scottish descent. :225 Before the Act of Union and since the Second World War, the primary destination for emigrants are other countries in Europe; major destinations have included Poland and Northern Ireland. In between, many Scots emigrated to the New World or other British colonies. :229 Although economic downturns caused temporary increases in emigration, the largest exodus occurred during the period of economic growth in the nineteenth and twentieth centuries, and well-educated Scots were more likely to emigrate. :231 In the 2000 Census, 9.2 million Americans self-reported some degree of Scottish descent, while the Scottish-Canadian community accounts for 4.7 million people. On the 2011 census, 54% of the Scottish population reported being Christian while nearly 37% reported not having a religion. Since the Scottish Reformation of 1560, the Church of Scotland has been Protestant and Calvinist in theology, including belief in predestination. Since 1690 it has had a Presbyterian system of church government and enjoys independence from the state. :44–45 Historically, the Church of Scotland played a key role in poor relief:48 although secular campaigners have attacked it for its role in witch trials and control over people's personal lives. :58 Thirty-two percent of Scots identified their religion as "Church of Scotland" on the 2011 census, a drop of ten percentage points since 2001. Most of the sixteen percent of Scots who profess Catholic faith live in Greater Glasgow and the north-west Highlands; many are descended from nineteenth-century Irish immigrants. :52 Other Christian denominations, including the Scottish Episcopal Church and the Free Church of Scotland,:57 account for 5.5% of Scots. Islam is the largest non-Christian religion, with smaller Hindu, Buddhist, Jewish, and Sikh communities. Combined, non-Christian religions account for less than 3% of the Scottish population. The head of state of the United Kingdom is the monarch, currently Queen Elizabeth II (since 1952). Scotland has limited self-government within the United Kingdom, as well as representation in the UK Parliament. Executive and legislative powers respectively have been devolved to the Scottish Government and the Scottish Parliament at Holyrood in Edinburgh since 1999. The UK Parliament retains control over reserved matters specified in the Scotland Act 1998, including UK taxes, social security, defence, international relations and broadcasting. [not in citation given] The Scottish Parliament has legislative authority for all other areas relating to Scotland. It initially had only a limited power to vary income tax, but powers over taxation and social security were significantly expanded by the Scotland Acts of 2012 and 2016. The Scottish Parliament can give legislative consent over devolved matters back to the UK Parliament by passing a Legislative Consent Motion if United Kingdom-wide legislation is considered more appropriate for a certain issue. The programmes of legislation enacted by the Scottish Parliament have seen a divergence in the provision of public services compared to the rest of the UK. For instance, university education and care services for the elderly are free at point of use in Scotland, while fees are paid in the rest of the UK. Scotland was the first country in the UK to ban smoking in enclosed public places. In the 2016 election, the Scottish National Party (SNP) won 63 of the 129 seats available. Nicola Sturgeon, the leader of the SNP, has been the First Minister since November 2014. The Conservative Party became the largest opposition party in the 2016 elections, with the Labour Party, Liberal Democrats and the Green Party also represented in the Parliament. The next Scottish Parliament election is due to be held on 6 May 2021. Scotland is represented in the British House of Commons by 59 MPs elected from territory-based Scottish constituencies. In the 2017 general election, the SNP won 35 of the 59 seats. This represented a significant decline from the 2015 general election, when the SNP won 56 seats. Conservative, Labour and Liberal Democrat parties also represent Scottish constituencies in the House of Commons. The next United Kingdom general election is scheduled for 5 May 2022. The Scotland Office represents the UK government in Scotland on reserved matters and represents Scottish interests within the UK government. The Scotland Office is led by the Secretary of State for Scotland, who sits in the Cabinet of the United Kingdom. Conservative MP David Mundell has held the position since May 2015. Whilst foreign policy remains a reserved matter, the Scottish Government still has the power and ability to strengthen and develop Scotland, the economy and Scottish interests on the world stage and encourage foreign businesses, international devolved, regional and central governments to invest in Scotland. Whilst the First Minister usually undertakes a number of foreign and international visits to promote Scotland, international relations, European and Commonwealth relations are also included within the portfolios of both the Cabinet Secretary for Culture, Tourism and External Affairs (responsible for international development) and the Minister for International Development and Europe (responsible for European Union relations and international relations). 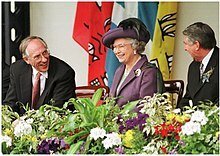 During the G8 Summit in 2005, then First Minister Jack McConnell welcomed each head of government of the G8 nations to the countries Glasgow Prestwick Airport on behalf of then UK Prime Minister Tony Blair. During McConnell's time as First Minister, several relations with Scotland, including Scottish and Russian relations strengthened following a visit by President of Russia Vladimir Putin to Edinburgh. McConnell, speaking at the end, highlighted that the visit by Putin was a "post-devolution" step towards "Scotland regaining its international identity". Under the Salmond administration, Scotland's trade and investment deals with countries such as China and Canada, where Salmond established the Canada Plan 2010–2015 which aimed to strengthen "the important historical, cultural and economic links" between both Canada and Scotland. To promote Scotland's interests and Scottish businesses in North America, there is a Scottish Affairs Office located in Washington, D.C. with the aim to promoting Scotland in both the United States and Canada. During a 2017 visit to the United States, First Minister Nicola Sturgeon met with Jerry Brown, Governor of California, where both signed an agreement committing both the Government of California and the Scottish Government to work together to tackle climate change, as well as Sturgeon signing a £6.3 million deal for Scottish investment from American businesses and firms promoting trade, tourism and innovation. During an official visit to the Republic of Ireland in 2016, Sturgeon claimed that is it "important for Ireland and Scotland and the whole of the British Isles that Ireland has a strong ally in Scotland". During the same engagement, Sturgeon became the first head of government to address the Seanad Éireann, the Upper House of the Irish Parliament. A policy of devolution had been advocated by the three main UK parties with varying enthusiasm during recent history. A previous Labour leader. John Smith, described the revival of a Scottish parliament as the "settled will of the Scottish people". The devolved Scottish Parliament was created after a referendum in 1997 found majority support for both creating the Parliament and granting it limited powers to vary income tax. The Scottish National Party (SNP), which supports Scottish independence, was first elected to form the Scottish Government in 2007. The new government established a "National Conversation" on constitutional issues, proposing a number of options such as increasing the powers of the Scottish Parliament, federalism, or a referendum on Scottish independence from the United Kingdom. In rejecting the last option, the three main opposition parties in the Scottish Parliament created a commission to investigate the distribution of powers between devolved Scottish and UK-wide bodies. [not in citation given] The Scotland Act 2012, based on proposals by the commission, was subsequently enacted devolving additional powers to the Scottish Parliament. In August 2009 the SNP proposed a bill to hold a referendum on independence in November 2010. Opposition from all other major parties led to an expected defeat. After the 2011 elections gave the SNP an overall majority in the Scottish Parliament, a referendum on independence for Scotland was held on 18 September 2014. The referendum resulted in a rejection of independence, by 55.3% to 44.7%. During the campaign, the three main parties in the UK Parliament pledged to extend the powers of the Scottish Parliament. An all-party commission chaired by Lord Smith of Kelvin was formed. Following a referendum on the UK's membership of the European Union on 23 June 2016, where a UK-wide majority voted to withdraw from the EU whilst a majority within Scotland voted to remain, Scotland's First Minister, Nicola Sturgeon, announced that as a result a new independence referendum was "highly likely". Historical subdivisions of Scotland included the mormaerdom, stewartry, earldom, burgh, parish, county and regions and districts. Modern Scotland is subdivided in various ways depending on the purpose. In local government, there have been 32 single-tier council areas since 1996, whose councils are responsible for the provision of all local government services. Decisions are made by councillors who are elected at local elections every five years. The head of each council is the Lord Provost or Provost alongside the Leader of the Council, with a Chief Executive being appointed as director of the council area. City status in the United Kingdom is conferred by letters patent. There are seven cities in Scotland: Aberdeen, Dundee, Edinburgh, Glasgow, Inverness, Stirling and Perth. Scots law provides for three types of courts responsible for the administration of justice: civil, criminal and heraldic. The supreme civil court is the Court of Session, although civil appeals can be taken to the Supreme Court of the United Kingdom (or before 1 October 2009, the House of Lords). The High Court of Justiciary is the supreme criminal court in Scotland. 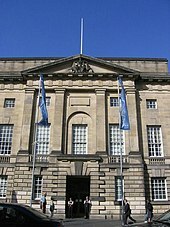 The Court of Session is housed at Parliament House, in Edinburgh, which was the home of the pre-Union Parliament of Scotland with the High Court of Justiciary and the Supreme Court of Appeal currently located at the Lawnmarket. The sheriff court is the main criminal and civil court, hearing most cases. There are 49 sheriff courts throughout the country. [not in citation given] District courts were introduced in 1975 for minor offences and small claims. These were gradually replaced by Justice of the Peace Courts from 2008 to 2010. The Court of the Lord Lyon regulates heraldry. The Scottish Prison Service (SPS) manages the prisons in Scotland, which collectively house over 8,500 prisoners. The Cabinet Secretary for Justice is responsible for the Scottish Prison Service within the Scottish Government. Health care in Scotland is mainly provided by NHS Scotland, Scotland's public health care system. This was founded by the National Health Service (Scotland) Act 1947 (later repealed by the National Health Service (Scotland) Act 1978) that took effect on 5 July 1948 to coincide with the launch of the NHS in England and Wales. Prior to 1948, the Highlands and Islands Medical Service provided state-funded medical care to people in the Highlands and Islands. Healthcare policy and funding is the responsibility of the Scottish Government's Health Directorates. The current Cabinet Secretary for Health and Sport is Jeane Freeman and the Director-General (DG) Health and chief executive, NHS Scotland is Paul Gray. Rates of some noncommunicable diseases, including heart disease and lung cancer, are among the highest in Europe and are leading causes of death. In 2008, the NHS in Scotland had around 158,000 staff including more than 47,500 nurses, midwives and health visitors and over 3,800 consultants. There are also more than 12,000 doctors, family practitioners and allied health professionals, including dentists, opticians and community pharmacists, who operate as independent contractors providing a range of services within the NHS in return for fees and allowances. These fees and allowances were removed in May 2010, and prescriptions are entirely free, although dentists and opticians may charge if the patient's household earns over a certain amount, about £30,000 per annum. Scotland had an estimated nominal gross domestic product (GDP) of up to £152 billion in 2015. In 2014, Scotland's per capita GDP was one of the highest in the EU. Scotland has a Western-style open mixed economy closely linked with the rest of the UK and the wider world. Traditionally, the Scottish economy has been dominated by heavy industry underpinned by shipbuilding in Glasgow, coal mining and steel industries. Petroleum related industries associated with the extraction of North Sea oil have also been important employers from the 1970s, especially in the north-east of Scotland. In February 2012, the Centre for Economics and Business Research concluded that "Scotland receives no net subsidy" from the UK, as greater per capita tax generation in Scotland balanced out greater per capita public spending. More recent data, from 2012–13, show that Scotland generated 9.1% (£53.1bn; this included a geographical share of North Sea oil revenue – without it, the figures were 8.2% and £47.6bn) of the UK's tax revenues and received 9.3% (£65.2bn) of spending. Scotland's public spending deficit in 2012–13 was £12bn, a £3.5bn increase on the previous year; over the same period, the UK's deficit decreased by £2.6bn. Over the past thirty years, Scotland contributed almost £20billion to the UK economy. In the final quarter of 2016, the Scottish economy contracted by 0.2%; the UK as a whole grew by 0.7% in the same period. As of September 2015, the Scottish unemployment rate of 5.9% was above the UK rate of 5.5%, while the Scottish employment rate of 74.0% was higher than the UK figure of 73.5%. De-industrialisation during the 1970s and 1980s saw a shift from a manufacturing focus towards a more service-oriented economy. Between April-June 2018, Scotland's economy was the best performing onshore economy in the United Kingdom, with Scotland outperforming the Economy of the United Kingdom as a whole, when the Scottish economy grew by 0.5% compared to UK economic growth of 0.4%. In the final quarter of 2018 (July-September), Scotland's economy grew by 0.3% in real-terms which compared to the same period in the previous year (July-September 2017), the economy of Scotland has grown +1.5%. Based on recent publications from the Scottish Government, the largest single contributor to this period of growth in Scotland's economy was the construction sector. Edinburgh is the financial services centre of Scotland, with many large finance firms based there, including: Lloyds Banking Group (owners of HBOS); the Government-owned Royal Bank of Scotland and Standard Life. Edinburgh was ranked 15th in the list of world financial centres in 2007, but fell to 37th in 2012, following damage to its reputation, and in 2016 was ranked 56th out of 86. In 2014, total Scottish exports (excluding intra-UK trade) were estimated to be £27.5 billion. Scotland's primary exports include whisky, electronics and financial services. The United States, Netherlands, Germany, France, and Norway constitute the country's major export markets. Scotland's Gross Domestic Product (GDP), including oil and gas produced in Scottish waters, was estimated at £150 billion for the calendar year 2012. If the reserves were split by population, that figure would be reduced to 9%. Whisky is one of Scotland's more known goods of economic activity. Exports increased by 87% in the decade to 2012 and were valued at £4.3 billion in 2013, which was 85% of Scotland's food and drink exports. It supports around 10,000 jobs directly and 25,000 indirectly. It may contribute £400–682 million to Scotland, rather than several billion pounds, as more than 80% of whisky produced is owned by non-Scottish companies. A briefing published in 2002 by the Scottish Parliament Information Centre (SPICe) for the Scottish Parliament's Enterprise and Life Long Learning Committee stated that tourism accounted for up to 5% of GDP and 7.5% of employment. Although the Bank of England is the central bank for the UK, three Scottish clearing banks issue Sterling banknotes: the Bank of Scotland, the Royal Bank of Scotland and the Clydesdale Bank. The value of the Scottish banknotes in circulation in 2013 was £3.8 billion, underwritten by the Bank of England using funds deposited by each clearing bank, under the Banking Act 2009, in order to cover the total value of such notes in circulation. Although Scotland has a long military tradition predating its union with England,:238 its armed forces now form part of the British Armed Forces. Scottish regiments in the British Army include the Royal Regiment of Scotland, the Scots Guards, the Royal Scots Dragoon Guards and the 154 (Scottish) Regiment RLC, an Army Reserve Regiment of the Royal Logistic Corps. More than 4,000 Scots serve in the British Army around the world. A single front-line Royal Air Force base is located in Scotland. RAF Lossiemouth, located in Moray, is the most northerly air defence fighter base in the United Kingdom and is home to three fast-jet squadrons equipped with the Eurofighter Typhoon. Because of their topography and perceived remoteness, parts of Scotland have housed many sensitive defence establishments. Between 1960 and 1991, the Holy Loch was a base for the US fleet of Polaris ballistic missile submarines. By 2020, HMNB Clyde will be the base of all Royal Navy submarines. Currently, it hosts several submarines including the four Trident-armed, Vanguard class, ballistic missile submarines that comprise the UK's nuclear deterrent. The naval base is one of Scotland's largest employers, with 6,800 workers on site. The Scottish education system has always been distinct from the rest of the United Kingdom, with a characteristic emphasis on a broad education. In the 15th century, the Humanist emphasis on education cumulated with the passing of the Education Act 1496, which decreed that all sons of barons and freeholders of substance should attend grammar schools to learn "perfyct Latyne", resulting in an increase in literacy among a male and wealthy elite. In the Reformation, the 1560 First Book of Discipline set out a plan for a school in every parish, but this proved financially impossible. In 1616 an act in Privy council commanded every parish to establish a school. By the late seventeenth century there was a largely complete network of parish schools in the lowlands, but in the Highlands basic education was still lacking in many areas. Education remained a matter for the church rather than the state until the Education (Scotland) Act 1872. The Curriculum for Excellence, Scotland's national school curriculum, presently provides the curricular framework for children and young people from age 3 to 18. All 3- and 4-year-old children in Scotland are entitled to a free nursery place. Formal primary education begins at approximately 5 years old and lasts for 7 years (P1–P7); children in Scotland study for National Qualifications. The school leaving age is 16, after which students may choose to remain at school and study for Higher or Advanced Higher qualifications. A small number of students at certain private, independent schools may follow the English system and study towards GCSEs and A and AS-Levels instead. There are fifteen Scottish universities, some of which are amongst the oldest in the world. [vague] These include the University of St Andrews, the University of Glasgow, the University of Aberdeen and the University of Edinburgh—many of which are ranked amongst the best in the UK. [vague] Proportionally, Scotland had more universities in QS' World University Rankings' top 100 in 2012 than any other nation. The country produces 1% of the world's published research with less than 0.1% of the world's population, and higher education institutions account for 9% of Scotland's service sector exports. Scotland's University Courts are the only bodies in Scotland authorised to award degrees. Tuition is handled by the Student Awards Agency Scotland (SAAS), which does not charge fees to what it defines as "Young Students". Young Students are defined as those under 25, without children, marriage, civil partnership or cohabiting partner, who have not been outside of full-time education for more than three years. Fees exist for those outside the young student definition, typically from £1,200 to £1,800 for undergraduate courses, dependent on year of application and type of qualification. Postgraduate fees can be up to £3,400. The system has been in place since 2007 when graduate endowments were abolished. Labour's education spokesperson Rhona Brankin criticised the Scottish system for failing to address student poverty. Scotland's universities are complemented in the provision of Further and Higher Education by 43 colleges. Colleges offer National Certificates, Higher National Certificates, and Higher National Diplomas. These Group Awards, alongside Scottish Vocational Qualifications, aim to ensure Scotland's population has the appropriate skills and knowledge to meet workplace needs. In 2014, research reported by the Office for National Statistics found that Scotland was the most highly educated country in Europe and among the most well-educated in the world in terms of tertiary education attainment, with roughly 40% of people in Scotland aged 16–64 educated to NVQ level 4 and above. [not in citation given] Based on the original data for EU statistical regions, all four Scottish regions ranked significantly above the European average for completion of tertiary-level education by 25- to 64-year-olds. The bagpipes are a well known symbol of Scotland. Scottish music is a significant aspect of the nation's culture, with both traditional and modern influences. A famous traditional Scottish instrument is the Great Highland bagpipe, a wind instrument consisting of three drones and a melody pipe (called the chanter), which are fed continuously by a reservoir of air in a bag. Bagpipe bands, featuring bagpipes and various types of drums, and showcasing Scottish music styles while creating new ones, have spread throughout the world. The clàrsach (harp), fiddle and accordion are also traditional Scottish instruments, the latter two heavily featured in Scottish country dance bands. There are many successful Scottish bands and individual artists in varying styles including Annie Lennox, Amy Macdonald, Runrig, Belle and Sebastian, Boards of Canada, Camera Obscura, Cocteau Twins, Deacon Blue, Franz Ferdinand, Susan Boyle, Emeli Sandé, Texas, The View, The Fratellis, Twin Atlantic and Biffy Clyro. Other Scottish musicians include Shirley Manson, Paolo Nutini, Andy Stewart and Calvin Harris. [not in citation given] Scotland hosts several music festivals including the Royal National Mòd and Celtic Connections. Scotland has a literary heritage dating back to the early Middle Ages. The earliest extant literature composed in what is now Scotland was in Brythonic speech in the 6th century, but is preserved as part of Welsh literature. Later medieval literature included works in Latin, Gaelic, Old English and French. The first surviving major text in Early Scots is the 14th-century poet John Barbour's epic Brus, focusing on the life of Robert I, and was soon followed by a series of vernacular romances and prose works. In the 16th century, the crown's patronage helped the development of Scots drama and poetry, but the accession of James VI to the English throne removed a major centre of literary patronage and Scots was sidelined as a literary language. Interest in Scots literature was revived in the 18th century by figures including James Macpherson, whose Ossian Cycle made him the first Scottish poet to gain an international reputation and was a major influence on the European Enlightenment. It was also a major influence on Robert Burns, whom many consider the national poet, and Walter Scott, whose Waverley Novels did much to define Scottish identity in the 19th century. Towards the end of the Victorian era a number of Scottish-born authors achieved international reputations as writers in English, including Robert Louis Stevenson, Arthur Conan Doyle, J. M. Barrie and George MacDonald. In the 20th century the Scottish Renaissance saw a surge of literary activity and attempts to reclaim the Scots language as a medium for serious literature. Members of the movement were followed by a new generation of post-war poets including Edwin Morgan, who would be appointed the first Scots Makar by the inaugural Scottish government in 2004. From the 1980s Scottish literature enjoyed another major revival, particularly associated with a group of writers including Irvine Welsh. Scottish poets who emerged in the same period included Carol Ann Duffy, who, in May 2009, was the first Scot named UK Poet Laureate. The image of St. Andrew, martyred while bound to an X-shaped cross, first appeared in the Kingdom of Scotland during the reign of William I. Following the death of King Alexander III in 1286 an image of Andrew was used on the seal of the Guardians of Scotland who assumed control of the kingdom during the subsequent interregnum. Use of a simplified symbol associated with Saint Andrew, the saltire has its origins in the late 14th century; the Parliament of Scotland decreeing in 1385 that Scottish soldiers should wear a white Saint Andrew's Cross on the front and back of their tunics. Use of a blue background for the Saint Andrew's Cross is said to date from at least the 15th century. The symbol was adopted as the national flag of Scotland. Since 1606 the saltire has also formed part of the design of the Union Flag. There are numerous other symbols and symbolic artefacts, both official and unofficial, including the thistle, the nation's floral emblem (celebrated in the song, The Thistle o' Scotland), the Declaration of Arbroath, incorporating a statement of political independence made on 6 April 1320, the textile pattern tartan that often signifies a particular Scottish clan, the royal Lion Rampant flag and the Honours of Scotland which are displayed in Edinburgh Castle. Although there is no official national anthem of Scotland, Flower of Scotland is played on special occasions and sporting events such as football and rugby matches involving the Scotland national teams and since 2010 is also played at the Commonwealth Games after it was voted the overwhelming favourite by participating Scottish athletes. Other songs that have been suggested as possible national anthems include Scotland the Brave, Caledonia, Highland Cathedral, Scots Wha Hae, A Man's A Man for A' That and I'm Gonna Be (500 Miles). St Andrew's Day, 30 November, is the national day, although Burns' Night tends to be more widely observed, particularly outside Scotland. In 2006, the Scottish Parliament passed the St Andrew's Day Bank Holiday (Scotland) Act 2007, designating the day an official bank holiday. Scottish cuisine has distinctive attributes and recipes of its own but shares much with wider British and European cuisine as a result of local and foreign influences, both ancient and modern. Traditional Scottish dishes exist alongside international foodstuffs brought about by migration. Scotland's natural larder of game, dairy products, fish, fruit, and vegetables is the chief factor in traditional Scots cooking, with a high reliance on simplicity and a lack of spices from abroad, as these were historically rare and expensive. 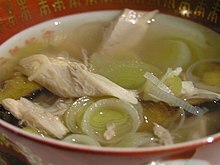 During the Late Middle Ages and early modern era, French cuisine played a role in Scottish cookery due to cultural exchanges brought about by the "Auld Alliance", especially during the reign of Mary, Queen of Scots. The national dish of Scotland is haggis, a pudding consisting of sheeps' offal, oatmeal, onion, spices and fat, cooked in a casing. Scotland's national drink is whisky, though Irn-Bru, a popular carbonated soft drink, is often described as "Scotland's other national drink". National newspapers such as the Daily Record, The Herald, The Scotsman and The National are all produced in Scotland. Important regional dailies include the Evening News in Edinburgh, The Courier in Dundee in the east, and The Press and Journal serving Aberdeen and the north. Scotland is represented at the Celtic Media Festival, which showcases film and television from the Celtic countries. Scottish entrants have won many awards since the festival began in 1980. Television in Scotland is largely the same as UK-wide broadcasts, however, the national broadcaster is BBC Scotland, a constituent part of the British Broadcasting Corporation, the publicly funded broadcaster of the United Kingdom. It runs three national television stations, and the national radio stations, BBC Radio Scotland and BBC Radio nan Gàidheal, amongst others. Scotland also has some programming in the Gaelic language. BBC Alba is the national Gaelic-language channel. The main Scottish commercial television station is STV which broadcasts on two of the three ITV regions of Scotland. Scotland has a number of production companies which produce films and television programmes for Scottish, UK and international audiences. Popular films associated with Scotland through Scottish production or being filmed in Scotland include Braveheart (1995), Highlander (1986), Trainspotting (1996), Red Road (2006), Neds (2010), The Angel's Share (2012), Brave (2012) and Outlaw King (2018). Popular television programmes associated with Scotland include the long running BBC Scotland soap opera River City which has been broadcast since 2002, Still Game, a popular Scottish sitcom broadcast throughout the United Kingdom (2002–2007, revived in 2016), Rab C. Nesbitt, Two Doors Down and Take the High Road. The Scottish Football Association (SFA), the second-oldest national football association in the world, is the main governing body for football in Scotland. It operates the Scotland national football team, which contested the first ever international football match (a 0–0 draw with England on 30 November 1872). The national team last qualified for the World Cup finals in 1998, but finished last in their group stage. The Scotland women's team have achieved more recent success, qualifying for both Euro 2017 and the 2019 World Cup. Scottish club sides have achieved some success in European competitions, with Celtic winning the European Cup in 1967, Rangers and Aberdeen winning the UEFA Cup Winners' Cup in 1972 and 1983 respectively, and Aberdeen also winning the UEFA Super Cup in 1983. Celtic, Rangers and Dundee United have also reached and lost European finals, the most recent of these being in 2008. Scotland's primary sources for energy are provided though renewable energy (42%), nuclear (35%) and fossil fuel generation (22%). The Scottish Government has a target to have the equivalent of 50% of the energy for Scotland's heat, transport and electricity consumption to be supplied from renewable sources by 2030. Scotland has five international airports—Aberdeen, Edinburgh, Glasgow, Glasgow Prestwick, and Inverness—operating scheduled services to Europe, North America and Asia, as well domestic services to England, Northern Ireland and Wales. Highlands and Islands Airports operates eleven airports across the Highlands, Orkney, Shetland and the Western Isles, which are primarily used for short distance, public service operations. Edinburgh Airport is currently Scotland's busiest airport handling over 14 million passengers in 2018. It is also the UK's 6th busiest airport. British Airways, easyJet, flybe, Jet2, and Ryanair operate the majority of flights between Scotland and other major UK and European airports. There are currently three Scottish-based airlines: Directflight, Hebridean Air Services and Loganair. The Scottish motorways and major trunk roads are managed by Transport Scotland, while the remainder of the road network is managed by local authorities. Bus transport was privatized in the 1980s. Regular ferry services operate between the Scottish mainland and outlying islands. Ferries serving both the inner and outer Hebrides are principally operated by the state-owned enterprise Caledonian MacBrayne. Services to the Northern Isles are operated by Serco. Other routes, served by multiple companies, connect southwest Scotland to Northern Ireland. Additional routes are operated by local authorities. This page is based on the Wikipedia article Scotland; it is used under the Creative Commons Attribution-ShareAlike 3.0 Unported License (CC-BY-SA). You may redistribute it, verbatim or modified, providing that you comply with the terms of the CC-BY-SA.